KOPN is a non-profit listener supported community radio station founded in 1973. For over thirty years the station has provided a wide variety of programming, both entertaining and educational to Columbia and surrounding areas. Our signal covers a fifty-mile radius surrounding Columbia from our broadcasting studios located at 915 E. Broadway. Volunteers from the community produce all of our local shows and in keeping with our open-access philosophy, we provide radio broadcast and production training to interested community members. KOPN’s mission is to educate and enrich the lives of our membership and the community it serves, especially those underrepresented by the commercial media sector. We have a proud history of airing diverse programs and innovative topics, both on a local and national level. Through the 1970s and into the early 1990s, KOPN used a standard radio format of reel-to-reel tape to record and air all of our radio programs. We now use digital equipment and the programs on reel-to-reel tape can no longer be aired. To complicate matters, reel-to-reel tape has a limited lifespan and 30 years is toward the upper limit of that lifespan. We began to realize when we celebrated our thirty-year anniversary that we needed to begin to preserve our history. The taped programs needed to be restored and reformatted onto CD, which would allow us to preserve them and to actually rebroadcast them. The first grant we received to begin this process was through the Missouri Historical Records Grant Program (MHRGP) available through the State of Missouri, the State Documents Preservation Fund, the National Historical Publications and Records Commission and supported by the Missouri State Archives, a division of the Office of Secretary of State. We were awarded $7,888 in 2004 to begin this preservation process for three of our collections: Local History, Native-American Issues and African-American Issues. These reformatted CDs are now accessible to the general public in several venues: on site at the KOPN studios and at the Western Historical Manuscript Collection, University of Missouri-Columbia as well as being lent out to the patrons of the Mexico-Audrain County Library District. Catalogs are available at all area libraries. KOPN will also be rebroadcasting these programs in the future as well, so stay tuned! The MHRGP granted us an additional $1,700 to create this webpage which features a searchable catalog and a listening library of mp3s from a selection of reformatted tapes. This online catalog provides for even greater accessibility to the reformatted tapes and public awareness of the ongoing project. This webpage is one more way that the MHRGP supports our ongoing efforts in preservation. Receiving the financial award from MHRGP brought attention to the plight of our reel-to-reel collection and granted legitimacy to the idea of saving these tapes. 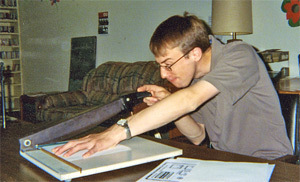 The program allowed us to create a template for reformatting and cataloging tapes. We not only benefited from the financial help but received archival training workshops as well. Dr. Shelly Croteau, the MHRGP administrator, provided guidance with all the necessary paperwork and any questions that developed concerning archival best practices. In addition, the startup of this project could not have been possible without the amazing efforts of many KOPN volunteers, staff members, and other supporters. Diane Rodgers founded the project and initially served as director. Our production work was completed by Jim Stephens of Deep Sky Audio, whose sense of humor and professionalism continue to make this project a resounding success. 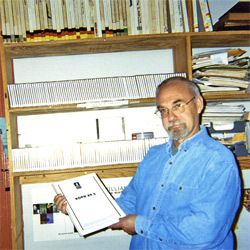 Jim Baden meticulously wrote up program descriptions and produced the first catalog. Janet Hammen provided invaluable budget assistance. Ian Donovan handled the post-CD preparation work for the MHRGP grant. He steadfastly came in each week to tackle the myriad of details in preparing the CDs for our library. 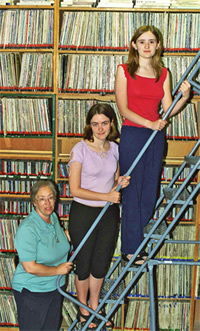 Cyndie, Jennifer and Sarah Kimball inventoried over 3,000 reel-to-reel tapes from the KOPN library. Big thanks are in order for their tireless dedication. 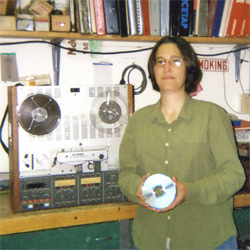 Jennifer Kimball now serves as director for the Reel-to-Reel Project. Cyndie Kimball serves as assistant director and cataloger for the Project and is invaluable to the project in the many hats she wears. Joy Rushing now oversees post-production work and her attention to detail is much appreciated. Diane Rodgers serves as a consultant for the project. Ian Donovan - cutting covers for CD cases. In April 2005 we received $300 from the City of Columbia's Office of Cultural Affairs and additional funds from Carol Goodnick to produce Memorable Moments: KOPN Spring Concert Series, which highlighted reformatted tapes of local musicians from the 1970s-1990s. Throughout the month of June various KOPN programmers rebroadcast a wide variety of local music including, Jazz, Blues, Folk, Women's, New Age/Experimental, Celtic and Bluegrass. For over thirty years KOPN has supported local musicians and this concert series was a tribute to this connection. As an added bonus, some of these concerts were performed at famous Columbia venues that no longer exist such as Cork and Dart, Lees, and Gladstones. We are thankful that the City of Columbia, through the Office of Cultural Affairs, funded this Concert Series in order to help preserve and present local music for all Columbians. At Luna Fair in May of 2005, our booth raised both awareness and money to reformat women's issues tapes. We would like to thank the following people for their contributions: Julianna Schroeder, Ellen Dugger and Gale Winn, Shelda Eggers, Sharon Giles, Diane Rodgers, M. Elaine Warn, Trevor Harris, Robert Goodson, Linda Jacobs Green, Royda Crose, Ann McGinity, Jim and Laura, Alyce Turner, anonymous donors and the organizers of Luna Fair. In July 2005 we received a gift of $3,500 from the State Historical Society of Missouri to reformat several specific collections. The tape series that were reformatted were: Missouri Legislative Choices; Missouri's Energy Policy; and Farm Forum. Farm Forum was a program that addressed the family farming crisis in Missouri. These programs range from locally taped agricultural forums with state experts to panel discussions and specials such as the history of agriculture. Missouri's Legislative Choices was co-produced with the Columbia League of Women Voters and was a weekly panel discussion program about legislative issues that were pending before the Missouri General Assembly in the late 1970s-early 1980s. These programs drew from a pool of Missouri politicians, local academics and community experts who participated in a discussion of the various legislative issues. Missouri's Energy Policy was a program that captured the many energy issues that affected Missouri in the late 1970s and early 1980s and although a historical look, it also ends up being quite timely for Missouri today. These three series of radio programs are of significant value to Missouri history, reflecting the views of local citizens and state experts on topics of interest to the community. We are extremely grateful to the State Historical Society of Missouri for helping to preserve these programs and allowing these archives to become accessible to the public. In October and December we received donations of $100 and $400 from the Columbia National Organization of Women and the Missouri National Organization of Women. The lost Brazen Hussy Collection was found and Rosie O' Really generously donated the funds needed to reformat these tapes. At Luna Fair 2006, volunteer Julie Schroeder helped us to staff a booth to raise awareness about the project, the women's collection and the special Women's History Month programming that was being highlighted from the collection. We received donations to reformat tapes from our women's collection. In June the project received donations from the Women's and Gender Studies Program at the University of Missouri - Columbia ($100), the Women's International League for Peace and Freedom ($40), and Hearthfires ($80) to reformat tapes from the women's collection. In June 2006 we received a $3,314 grant from the Columbia Office of Cultural Affairs to reformat tapes from the children's, poetry and local music collections. These tapes will be reformatted and rebroadcast in April, May and June 2007 for our Spring into the Arts program. This program will highlight the local talent that KOPN and Columbia have fostered over the years. These tapes range from the early 1970s to early 1990s and reflect the diverse programming that KOPN has offered from its beginning. In April for National Poetry Month we will partner with Hickman High School and make MP3s of a selection of our poetry tapes available via the web. These tapes include recordings of visits from nationally known poets - Maya Angelou, Robert Bly, etc. - as well as local poets and poetry festivals. In May we will partner with Stephens College Children's School and provide them with CD copies of tapes from our children's collection which will then be used for their reading program. The children's collection includes a variety of children's radio theater, often performed and sometimes even written by children. In addition to our partnerships, we will also rebroadcast poetry tapes in April and children's tapes in May. In June we will rebroadcast tapes from our extensive music collection, in a continuation of the Memorable Moments Concert Series that first aired in June 2005. Many wonderful programmers helped make that series a great success and we look forward to working with them again. We are especially pleased to add Ragtime and Classical music to this year's lineup. We are very excited about this grant, and the chance to reformat these tapes and make them not only available to our listeners and supporters, but also to local Columbia schools. In September the Black Studies Program at the University of Missouri - Columbia donated $100, and the director of the program, Dr. Julius E. Thompson donated $50 to reformat tapes from our Black Studies Collection. Jim Ellinger, former host of Zebra Sunrise, a prisoner advocacy show, donated tapes from his days at KOPN; one of these is a polemical tape of a prison escape. Jim sponsored the reformatting for these tapes. In February the project aired several Black History Month programs, including an interview with Bobby Seale of the Black Panthers and a speech by Judge Clyde Cahill, the first Black federal district judge to serve in the 8th Circuit. Additional programs were available on the project site to celebrate the month. For Women's History Month several women's issues programs were available on the project website throughout March. The programs included speeches by Betty Freidan and Bella Abzug, as well as programs featuring local panelists. Spring Into the Arts 2007 was launched in April with funding from the City of Columbia Office of Cultural Affairs. Several poetry programs were aired on KOPN to help celebrate poetry month; in addition, many more programs were available on the project website. KOPN partnered with Hickman High School to make the programs available to students. In May Spring Into the Arts continued with Children's Radio Theater programs. Archived original productions by Columbia Children were aired as part of the Tuesday afternoon children's programming, and more programs were available on the project website for listening at any time. Stephens College Children's School received copies of all programs to make them available for in-classroom use in their literacy program. Spring Into the Arts culminated with a June concert series. Big thanks to all the amazing KOPN programmers who made this series possible! Programs ranging from a KoKo Taylor concert to Norman Blake performing to a Boone County Fiddle Contest. Additional programs were also on the website. Spring Into the Arts successfully concluded at the end of June. Thanks again to the City of Columbia Office of Cultural Affairs, the Ken Shepherd Memorial Fund, Diane Rodgers, all the programmers who aired programs, Charlie and Joy for their technical assistance, and all of our listeners! In June Royda Crose sponsored the reformatting of the Peace Pilgrim programs. In July the University of Missouri - Columbia Peace Studies Program donated $100 to help reformat Peace Issues Programs. Check out the news section for a Missourian story about the project. We continue to look for funding and support. Thanks for taking the time to find out about this worthy project! If you would like to help out please email us at [email protected] and we will get back to you. Preservation practices are specific to each medium being preserved. This brief description pertains to reel to reel tape preservation issues and best practices. Reel to reel tape has a limited lifespan, anywhere from 10 to 40 years depending on initial tape quality and storage. To preserve tapes, several particular problems must be kept in mind. Sticky Shed is a condition afflicting tape that occurs when the oxide binder material interacts with humidity and rises to the surface of the tape making it “sticky”. Tape squealing as it is being played would be one indication and an indication to avoid as this means damage to your tape and your tape machine. In order to reformat a tape that exhibits sticky shed a process called baking is required. The tape is heated at a low temperature for a number of hours which allows for the oxide binder to temporarily adhere again in order to allow for transfer to a new reel or other medium. Although transferring tapes to new reel-to-reel tape may be considered ideal for preservation this will end up being more and more difficult to accomplish as the last tape company in the U.S. recently closed its doors. KOPN has its reels professionally reformatted. We maintain best practices and the authenticity of the material through reformatting to archive CD with only slight equalization (flat) to minimize tape hiss and other noise distortion but without any editing of the original recording. 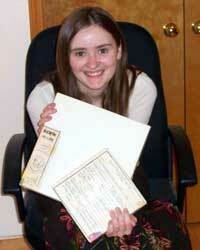 Once the reels are reformatted we send them to Western Historical Manuscript Collection-Columbia for archival storage.